The Satanic Cross, also known as the Leviathan Cross or the Cross of Satan is an intricate glyph made up of several individual components. Above is the double cross in which the lower crossbar is usually represented wider than the one on top. 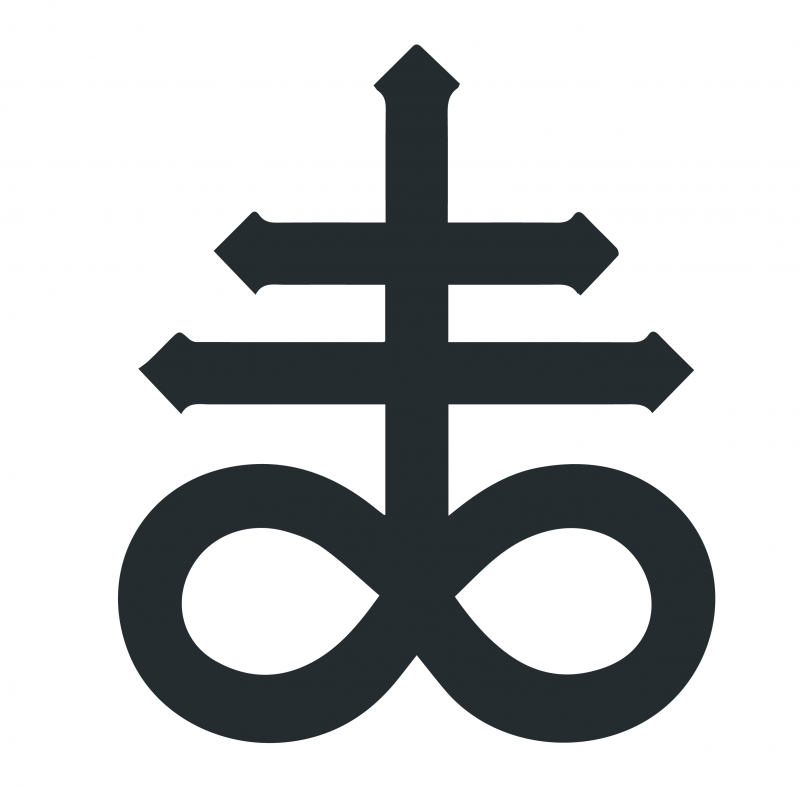 The double cross stands on the center of one of the most intriguing and enigmatic symbols humans know – the sign for infinity which looks like the figure ‘8’ lying on its side. It is perhaps this departure from what are usually simplistic ancient representations (for example the simple triangle and inverted triangle used to symbolize fire and water respectively) that gives the Leviathan Cross the appeal and air of mystery and power. It perhaps also a hint of the macabre – that makes it so memorable… and so popular. The Satanic Cross was originally the symbol for the element which was called brimstone in antiquity, and which we today know as sulfur. The association of sulfur with Satanism is rather dated, and has its origins in its use as the symbol for sulfur by European alchemists. It was one of the three special elements alchemists added to the classic Aristotelian system, with the other two being salt and Hydrargum or Quicksilver, which we now call Mercury. Brimstone is found naturally as a pale yellow solid which is brittle and odorless. In its natural solid (as a block or as a powder) form, sulfur does not react with air. However, when exposed to a flame, it burns in a way that is quite unlike any other element that we know. The substance liquefies before burning with a pale blue flame. For an ancient observer, the phenomena would have seemed like a solid had melted and started to burn with an otherworldly flame. It is because of this behavior that sulfur was looked upon with an altogether untrusting eye by people a long time ago. In fact, brimstone means ‘burning stone’, or the ‘stone that burns’. However, its association with the Devil and with Hell has more to do with geology than anything else. Sulfur deposits are often found in areas that display elevated levels of volcanic activity. They are also found in the vicinity of hot springs. This is especially true in the Middle East and the Mediterranean where the three Abrahamic religions have their origins. It is said that the region where the biblical cities of Sodom and Gomorrah were supposedly located had large deposits of sulfur. The Bible says that these two cities were destroyed in a hail of ‘fire and brimstone’. However, deeper research indicates that the flames of fire and brimstone would have had their origins in actual scenes that the ancient Israelites and Palestinians would have been witness to. The region is not unfamiliar with seismic tremors and there have been major earthquakes in recent times. Lava escaping from the bowels of the earth could easily have combined with sulfur to create hellish scenes. Rivers of lava and liquid rivers of melted brimstone would have made it seem like Hell had been unleashed on the face of the planet. Neither would have been able to be extinguished by the primitive firefighting methods to which the people would have had access. Sulfur produces the noxious and pungent gas, sulfur dioxide, when it burns. Sulfur dioxide is also a natural byproduct of volcanic eruptions. The U.S. EPA states that the inhalation of sulfur dioxide is associated with increased respiratory symptoms and disease, difficulty in breathing, and premature death. Research conducted in 2011 showed that inhaling sulfur dioxide can also contribute to increased occurrences of preterm births. All these side effects, accompanied by the choking effect created by the characteristic unpleasant smell of sulfur would have easily convinced simpler people that hell itself had touched their lives. It may stun you to discover that the latest research actually corroborates the traditional Christian view of brimstone associated with the pits of hell, which they saw as being deep in the ground beneath us. English researchers discovered in 2015 that the Earth’s core has reserves of sulfur which are 10 times greater than all the sulfur on the rest of the planet. In fact, the total mass of sulfur deep in our planet’s core equals about 10 percent of the mass of the moon. If nothing else, this does confirm for us that a volcanic eruption or any other rending of the earth that released lava would have been accompanied by the strong, noxious smell of sulfur. The Upside-down Cross: Sacrilege or Something Else? In the traditional cross with which most people are familiar, there is a single crossbar. This crossbar is placed high enough above the middle of the vertical shaft that we can tell it is closer to the top. This placement gives it an appearance which people virtually universally recognize as the symbol of the Christ and as a representation of the crucifixion of Jesus. Everywhere around the world, it is the symbol of the Church and the various denominations of Christianity. The general way people see things is that if a symbol is inverted, the resulting shape must indicate the opposite of the original meaning. On the surface, that is entirely logical and we see this belief at work in the paired representation of many ancient symbols. Water is depicted by a triangle with its single vertex pointing up, while the complimentary element, fire, is depicted as a triangle with the vertex pointing down. In eastern tradition, the symbol of the male and female, the yin and the yang, are complimentary shapes, too. By that logic, inverting the cross, we would get the symbol of the opposite of Jesus or God – Satan. That is perhaps the way Anton LaVey, founder of the Church of Satan envisioned things when he adopted the Leviathan Cross as the symbol of his Church. However, there is no such hard and fast rule. 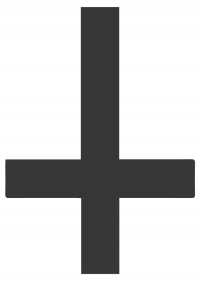 While the inverted cross has become a very popular symbol of anti-Christian belief by many Satanists and other practitioners of Wicca and associated religions who see the inverted cross with a similar eye, the inverted cross is just as firmly a part of Christianity as the traditional cross. The wider and more prominent arm of the Leviathan Cross is situated nearer to the base than the top of the vertical shaft. This is because when Simon Peter, the first Pope, was crucified head-down by the Roman emperor, Nero. However, as partial to all manner of barbarism that ancient Roman emperor were, the decision to be crucified upside-down is apparently of Saint Peter’s own choosing. It is said that when he was sentenced to death by crucifixion in 64 A.D., he proclaimed himself unworthy of being crucified in the same way as Jesus. Thus, the upside-down cross is the symbol of saint peter, the first Pope of the Roman Catholic Church. In fact, if you look closely at papal ceremonies, you will find that the Cross of Saint Peter or Petrine Cross, as it is known, is emblazoned on just about all items that officially belong to the office of the Pope. The symbol is also often worn by Christians who believe that wearing the original cross shape is disrespectful. However, it should be noted that the Petrine Cross is never depicted with a corpus like the traditional cross. A cross with two arms is also a common Christian symbol. The cross with two bars as depicted on the Cross of Satan is most similar to the Cross of Lorraine. It has a long history of use in Europe, particularly in France, and it gets its name from the French province of Lorraine. It was also used, prior to being adopted in France as a symbol of Christianity in the Kingdom of Hungary. It is perhaps these European influences that had some part in prompting Anton LaVey, whose parents had emigrated from Europe to America, into using them as a symbol. In Satanism, the emphasis is on the individual above the supernatural or the collective. 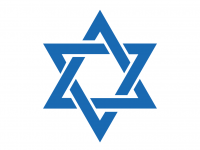 This perspective can be seen in the Sigil of Baphomet, the official, trademarked logo of the Church of Satan where the standard pentacle is inverted so a single point of the star faces directly downwards. It is said that the higher positioning of the crossbar on a traditional Cristian cross indicates submission to a higher power. On the other hand, LaVey’s inversion would have indicated that his beliefs were the opposite, that he lived his life with himself as its center. There is also the association with the ‘equal’ sign that must be explored in any study of the Leviathan Cross. 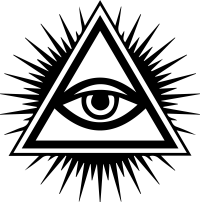 It can be interpreted as an emblem of the belief that everyone’s lives are equal. Some sources attribute to the inception of the Leviathan Cross to the Knights Templar. The infinity symbol or lemniscate is one of the most beautiful pagan symbols there is. It was introduced as the mathematical symbol for infinity rather recently, by the English mathematician, John Wallis, in 1655. It is said Wallis used the lemniscate because the Roman glyph for the numeral ‘1000’ was CIƆ, or CƆ, a representation that could be used to signify anything in large quantities. A competing theory is that it is a stylized rendering of the Greek letter ω (omega). 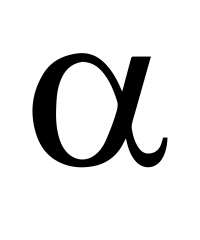 Omega was the last letter of the Greek alphabet and, thus, indicative of the ultimate limits of something. However, the use of the symbol far predates its mathematical application in the 17th century. In religion, it is first seen in the sigil of Saint Boniface, the English Christian monk who is known as the Apostle of the Germans. In it, the lemniscate is shown wrapped around the bars of the cross. It is unclear where and when the infinity symbol came to play a part in paganism. There is some literature that suggests that the ancient Egyptians used a similar symbol to refer to the forces of chaos from whence the universe was born. However, pagans are most familiar with the oft-seen image of the horizontal ‘8’ as a snake eating its own tail. This creature, which reveals no end and no beginning, is taken to be the sign of the unending nature of the soul and the universe, tying it to the concepts of rebirth and resurrection. In certain drawings of the Cross of Satan, the image of the serpent is shown consuming the base of the cross. The Leviathan was a terrible sea monster spoken of in the Hebrew Bible. The story of its defeat alludes to battles by heroes against sea serpents that can be found in Mesopotamian, Hindu and Norse mythology. Calling the Leviathan Cross the Cross of Satan seems an unfair allocation (or surrender) of a symbol with such ancient origins to the Church of Satan which only usurped the symbol in the 1960s. While we do not know why the infinity symbol came to be a part of a symbol that represented brimstone, it can be theorized that early, religious alchemists saw the juxtaposition of the cross upon the symbol of infinity as a representation of the infinite power of an omnipotent, omniscient God from whom Christ had come. Its use as the symbol for sulfur, which they would have associated with the awe-inspiring and terrifying cataclysms of earthquakes and volcanic eruptions alluded to their belief of an all-powerful God under whose eye they lived. The Leviathan Cross is a thing of beauty for the many parts that make up the whole. We may never decipher al their meanings, or their origins, but the symbol is a powerful one to use anywhere.